Preston return to National Two North one year after relegation having won 22 league games this season. The Hoppers reached a points total of 106, leaving their closest rivals, Hull, 15 points behind them. The Hoppers opened the scoring through Alex Ward before Ilkley overtook their hosts with a try from Dan Lawrence and a conversion from Ben Magee. Preston’s initial lapse in concentration was soon over as Number 8 Matt Lamprey crashed over the line to score his first try of the day. Former Durham University student, Jake Squirrel, kicked the conversion. Squirrel added a further two out of three conversion attempts before half time, following tries from Sam Scott, PJ Millea and Lamprey. Ilkley could only respond through a try, scored by Jack Mapleston, which was again converted by Magee. In the second half, Squirrel added another three points to his tally then the home side scored a spectacular try in a move that started on their own try line. Former Durham County player Scott Jordan, former Lancashire Cup Winner Ally Murray and coach Paul Arnold all contributed to Jack Akrigg’s try. In the closing stages, Ilkley came back in the game, scoring three tries through Tom Milner and Pat Power. This took the visitors try count to four, becoming the only side in the Northern Premier to score four tries in both their encounters with the Hoppers. Player-Coach Paul Arnold had nothing but praise for the club: “I am very proud of everyone involved at the Grasshoppers from players and coaches to fans and club officials,” the former England Saxon said after the game. 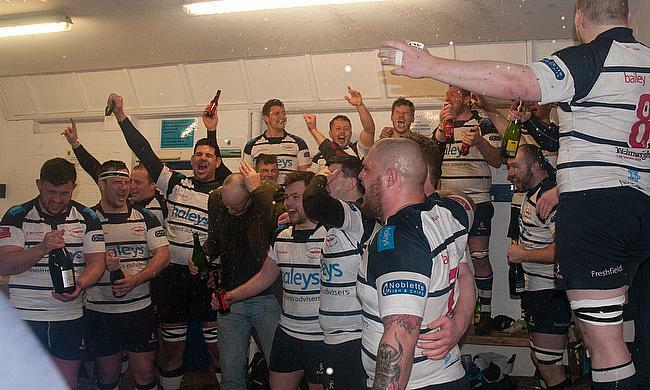 Meanwhile in the Northern Premier, Rossendale climbed up to fifth after beating Billingham 26-17. Third from bottom Morley narrowly overcame Kirkby Lonsdale 13-8 at home. Second-place Hull opened up a nine point gap over their nearest rivals Harrogate, beating Wirral 10-31 away from the LTS Leisure Ferens Ground. Third placed Harrogate’s home game against Pocklington was postponed. Only two games went ahead in the Midlands and South West Premier which was fortunate for Ivybridge as they won their game over Bracknell to survive their relegation battle. Birmingham and Solihull were unable to clinch promotion as their game against Newport Salop was postponed. However, fourth placed Scunthorpe fended off fifth placed Doncaster Phoenix.